Schwinn’s top-of-the-line middleweight model. Typical of “equipped” bicycles of the era, it is loaded with accessories–accounting for the $87.95 price tag as compared to the $52.95 price of of the basic Typhoon version of the otherwise-similar 26-inch boy’s-frame middleweight bicycle. 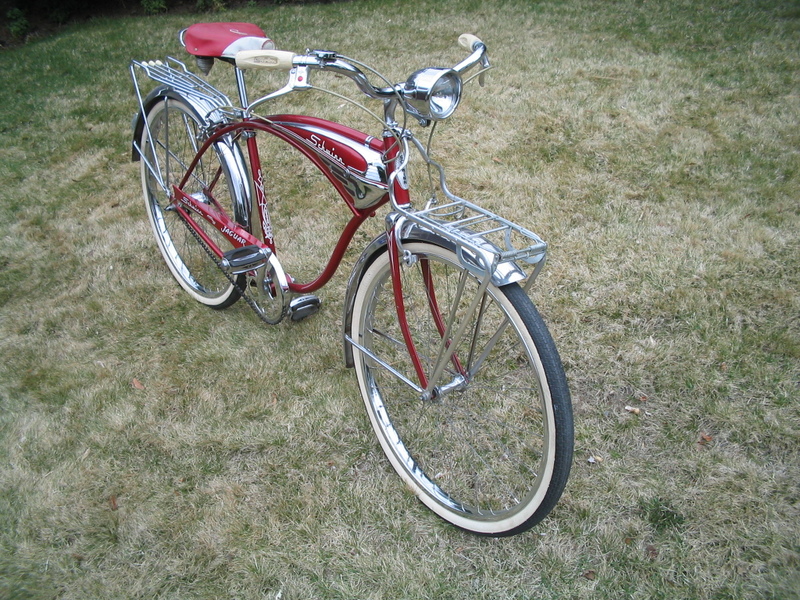 This deluxe bike’s original equipment includes: chrome “ball” headlight; hand-operated caliper brakes; front dual-articulated rack made by German Mayweg, designed to accommodate books or a lunch box; stainless steel fenders (as opposed to chromed steel for lesser models); 62-exclusive “Starburst” design Schwinn head badge; forged steel stem (as opposed to stamped steel), chrome fork crown; deluxe headset (bearing sets); whitewall Schwinn Westwind S-7 26 X 1 3/4 tires; chrome rims; chrome/painted horn tank; chrome seat post and clamp; deluxe two-tone Schwinn “S” seat with chrome rear crash rail and chrome beehive springs; chrome/painted deluxe finned chain guard; deluxe sport “bow” pedals; 3-speed internal shift hub (some 1960-1963 3-speed Schwinns used this trigger-operated Austrian hub, while most used a nearly identical British Sturmey-Archer hub); four-reflector “crutch tip” rear chrome decorative cargo rack, and plastic-chrome “teardrop” rear “S” reflector. While this Jag has a 3-speed hub, even the deluxe Schwinns of this era could be purchased with a single-speed coaster brake hub or a 2-speed Bendix Automatic “kick-back” hub. The earlier triple-red-band Bendix hub used metal discs for its braking mechanism, whereas their later triple-yellow-band hubs used a more efficient and serviceable expandable drum design.